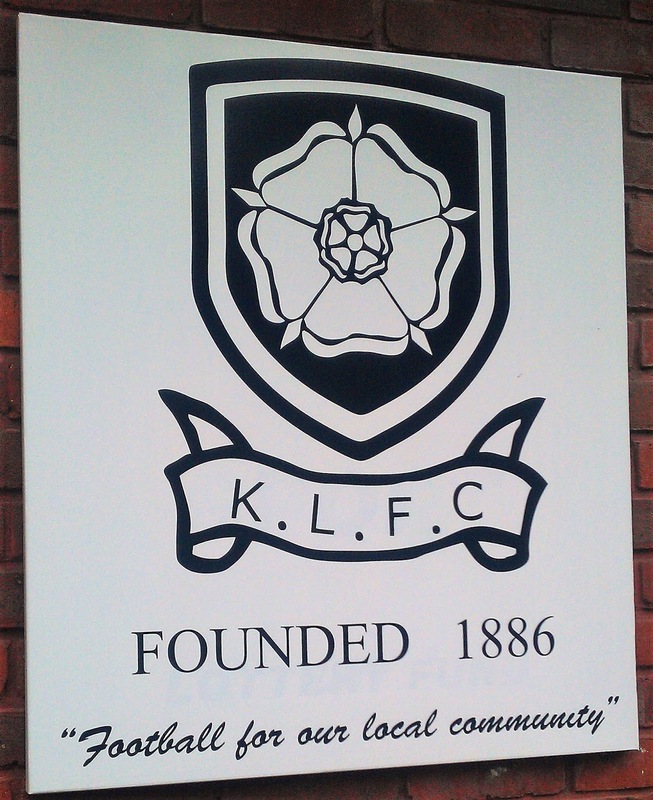 Kings Langley FC was founded in 1886, making them one of the oldest clubs in the county of Hertfordshire. They played in local leagues such as the Herts County League for the first 125 years of their history. 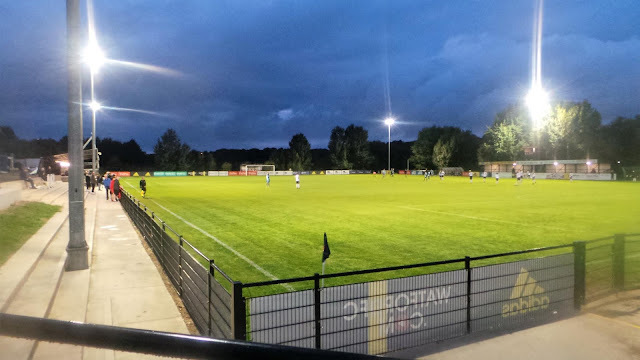 They'd been in the now step 7 Premier Division on and off since the mid-fifties, becoming champions twice in a row around ten years later, Continuous members of the top-tier since 1991, they made the step up to the Spartan South Midlands League in 2001 after finishing as runners-up to Oxhey Jets. 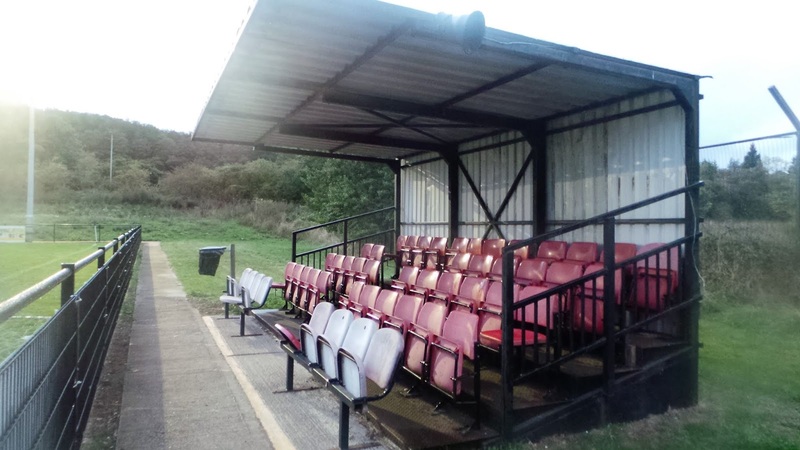 Starting in Division 1 they finished around mid-table for their first three seasons but were demoted in 2004 due to ground grading issues. In the interim, they managed to get the facilities in place and were promoted back up as champions in 2008. This time they were a lot more successful, finishing as runners-up to Royston Town in their firsts season back. Top-half finishes ensued and a second runners-up spot in 2014, this time behind Sun Postal Sports, saw them promoted to the Premier Division. 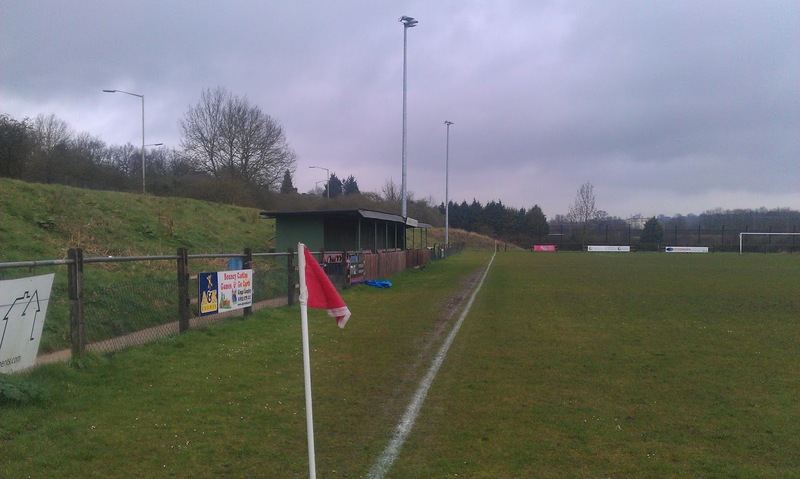 Since then, this village club have been on an incredible journey, winning both the Spartan South Midlands Premier and then the Southern League Divison 1 Central at the first attempt. Last season saw their debut in the Southern Premier and they successfully negotiated their way to survival, finishing 20th. This season, with just one relegation place, they are around the same area but sit 24 points clear and will take their place at step 3 for the third consecutive season next season. 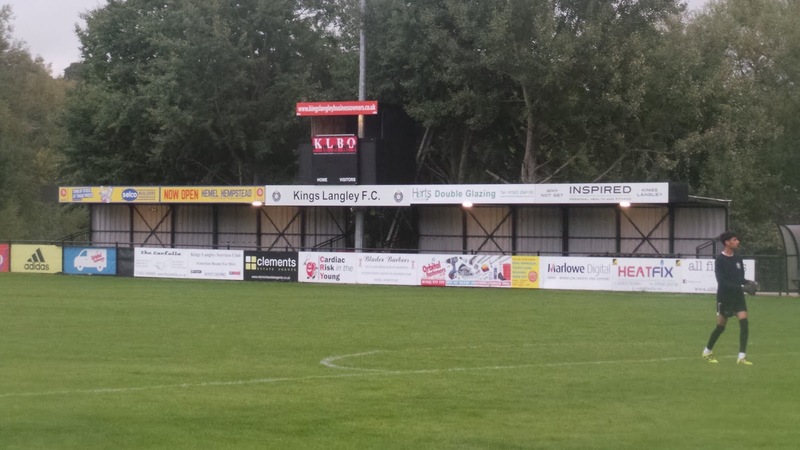 In the FA Cup, Kings Langley have reached the 2nd Qualifying Round in the last two seasons, this term they beat Haverhill Borough 8-0 before a 1-0 defeat at home to Margate. 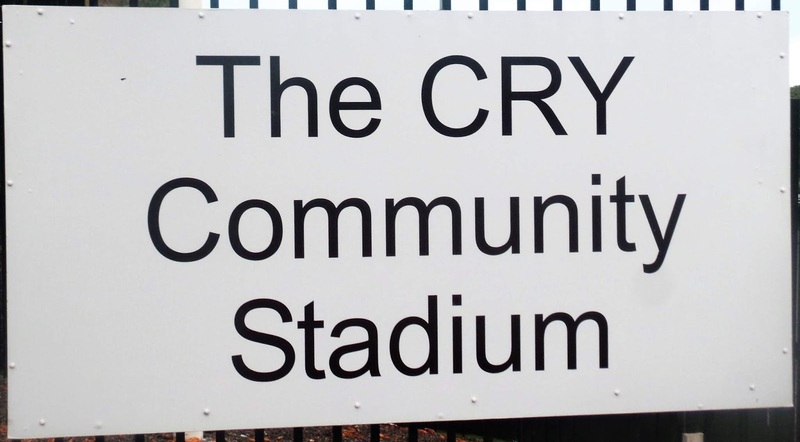 Last season saw their best run in the FA Trophy as they beat Heybridge Swifts & Enfield Town before a 3-1 defeat to AFC Sudbury in the 3rd Qualifying Round. In the FA Vase, the club didn't win a game until their fifth and final season in the competition. That was in 2014/15 when they beat Burton Park Wanderers and Berkhamsted before an incredible 6-5 defeat at Saffron Walden Town in the 2nd Round. Local cup wins include the Apsley Senior Cup three times, the Spartan South Midlands League Division 1 Cup twice, the Herts Intermediate Cup twice, the Chiltern Villages Cup twice as well as a host of others, most recently in 2016 when they lifted the Sir Stanley Rous Memorial Trophy. 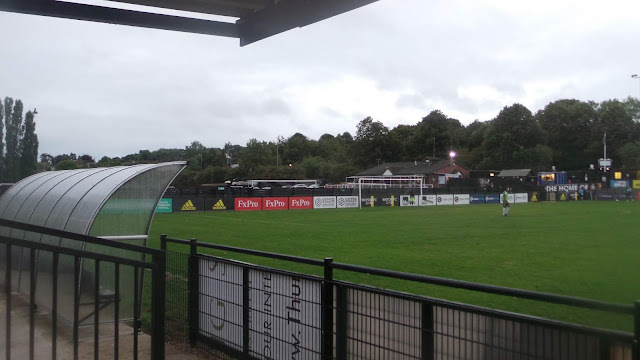 The village of Kings Langley has a population of just over 5,200 and residents have included former England manager Graham Taylor, footballer Stuart Slater, boxer Anthony Joshua and cricketer Steven Finn. Initially, I wasn't planning on going to my previous game at Cheshunt v Wycombe Wanderers in a pre-season friendly. I had been there and wanted to do a groundhop instead. 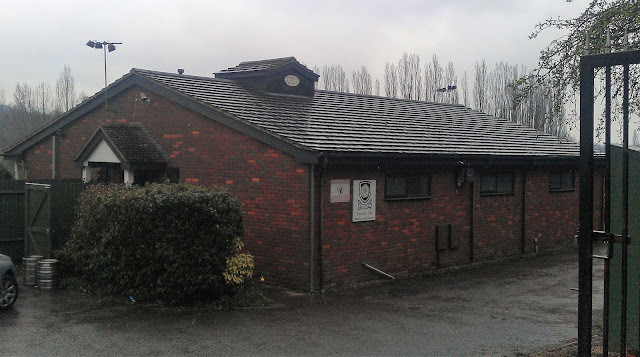 But then the game was put back to 1PM, due to the home side needed the clubhouse for a function in the evening. 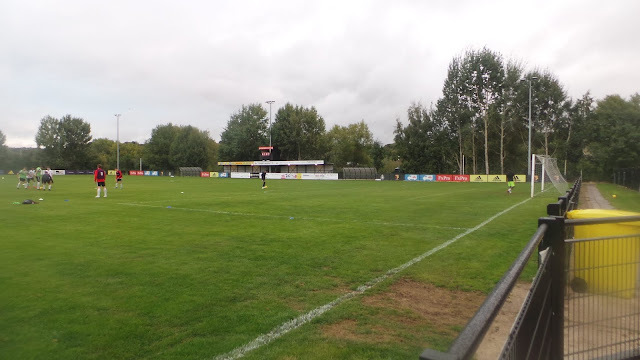 Anwar wanted to do Cheshunt as he had not been there before, and we could rush off and do another 3PM kick off that was close by. 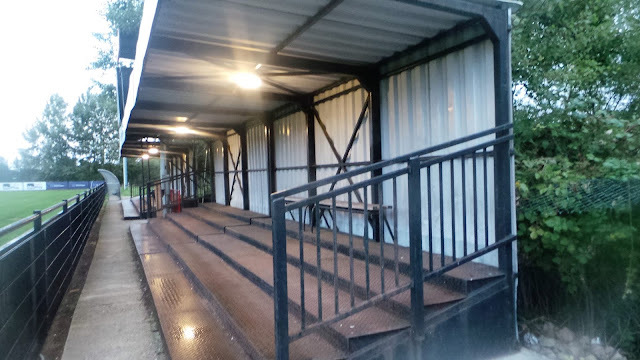 Of the 3 options on offer, Kings Langley v Hemel Hempstead Town looked the most attractive, and it would also give me the chance to tick another ground in the Spartan South Midlands League, which I was close to completing. It would also be nice to see the many new faces that we have signed in action for Wycombe. The last 2 days beforehand had seen me sample a fair few ciders, what with my West Country expedition on Thursday, and then the start of the Wetherspoons Cider Festival on the Friday night, which I walked to, a whole 9 mile round trip once I had got lost on the way back after following random footpaths. On the plus side I sampled 4 or 5 of the ciders, and had a decent night, even though I went out early and was back home just after 9. I didn't get much sleep though, and so wanted to leave it as late as possible before leaving. I left at 11, picking Anwar and his two kids up at 11.30. Though it was slow getting out of Aylesbury, we soon made swift progress along the A41 and M25 into Hertfordshire. 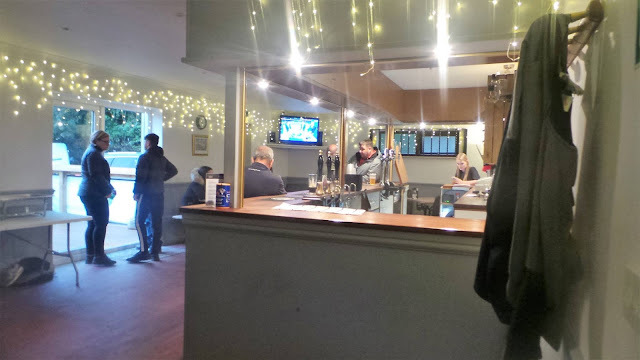 I got chatting to all the usual faces, having a pint of Strongbow in Cheshunt's clubhouse to help me relax for the game. I then realised that I only had a few quid left, and so a half-time dash to the cashpoint, nearly a mile away, was needed, luckily I only missed a few minutes of the game after jogging there and back. 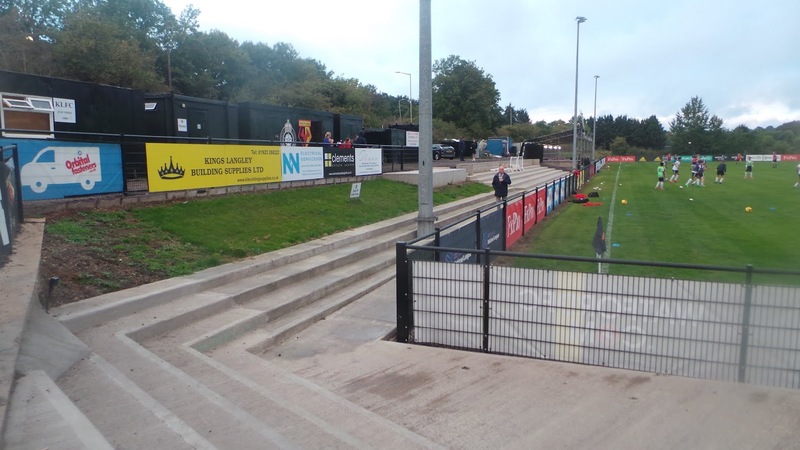 After the game, we made a swift exit to Kings Langley and got to the ground seven minutes into the game, by which time visitors Hemel were 1-0 up through Ben Mackey. 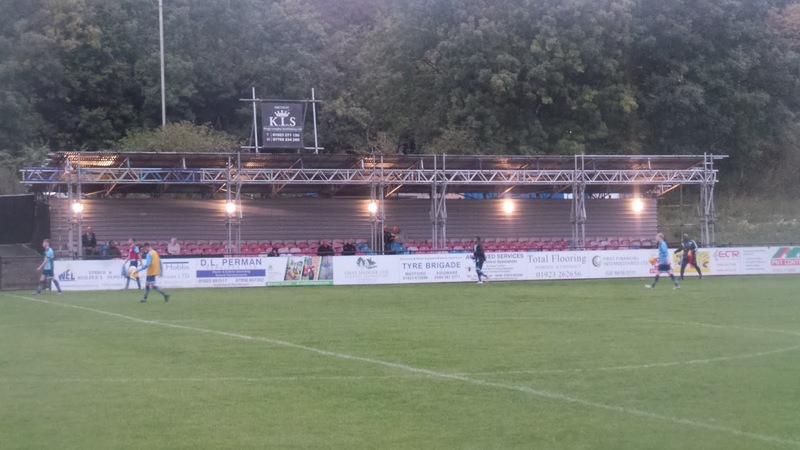 The visitors continued to be the better team, but it was Kings Langley who got the next goal. They were awarded a penalty for a foul in the area and it was duly despatched. Lewis Toomey's neat finish after a really decent through ball saw Hemel retake the lead, right on the halftime whistle. In the second half, it was much the same story. The lead was extended to 3-1 with a goal from Hemel's number 14, his name down as Fladzomer who looked a very useful player. The arrears were reduced with the best goal of the game, the Kings Langley player was almost at the halfway line when he scored, hitting the ball over the keeper's head. 2 further goals from Hemel, both decent strikes from Josh Chamberlain and Fladzomer made the final score 5-2, which was probably a fair reflection of the play. It had been a good day, with 2 decent games, even if the pace wasn't really there due to it being pre-season. I dropped Anwar off, before stopping at a shop to get some ciders for the World Cup 3rd place playoff final. Holland won that 3-0, to make it a pretty dismal end to the World Cup for Brazil, after their 7-1 defeat to Germany on Tuesday. I went to bed around 11, happy in the knowledge that the following day would be my last day at work for a whole week, time off for the first time in 4 months. I'd wanted to visit Kings Langley again for a while, mainly to update my blog. I'd been on their away coach to Tiverton last year and they had been really friendly and I'd had a great day out as I completed down to step 3 of the non-league pyramid. 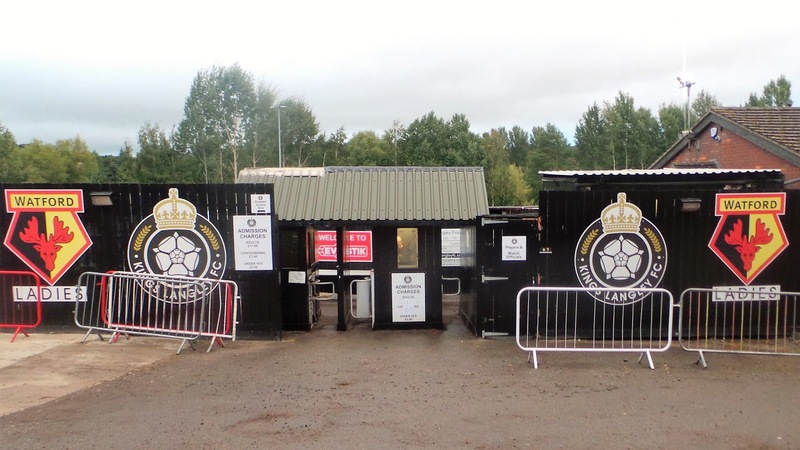 They'd also made improvements to their ground and got a new bar since my last visit, so I was keen to go down and take a look, with it being just 17 miles from home. Trouble was, games didn't come up very often when I was free. 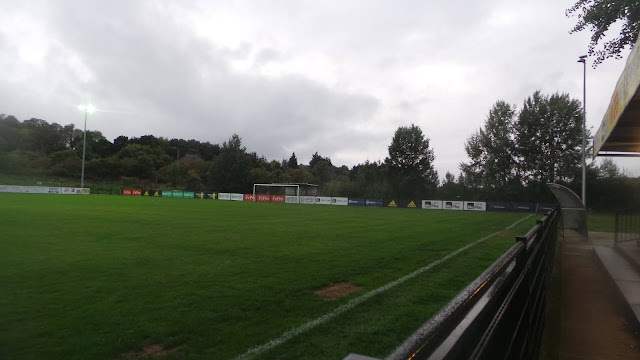 I'd considered a Youth Team game, but their website was not the best and I never did find out what league they played in. 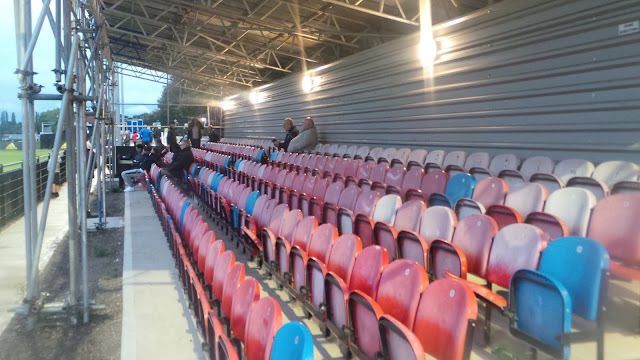 That was until my Twitter pal and fellow groundhopper Chris posted up that they had a game on a Thursday night, subject to the weather. I checked, expecting the recent deluge to put pay to my chances, however, thankfully, it was dry. Sadly, not dry enough though and so after hoping to go in May, I had to wait another four months for my revisit. By now, they'd expanded their youth setup and were playing more often. I actually passed up the opportunity to go to a game the previous week, but it turned out to be a blessing in disguise. On the day of the game, I was browsing through my Twitter at work and noticed that Kings Langley had posted details of the night's game. The opposition was very interesting, being Wycombe Wanderers Sports & Education Trust. The news that we had a youth team back had completely passed me by, but I was glad that we did. 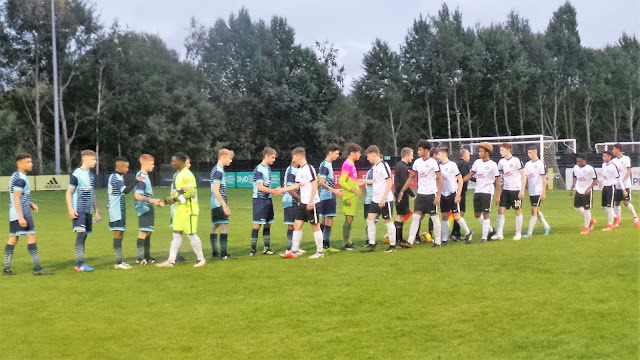 They'd lost their first game of the season 3-1 at home to AFC Dunstable, but it was a very inexperienced side that played, with a lot of them being just 15 in an under 18s league. There was better news, former player Slavi Spasov had gone on to sign for Oxford United and had scored in their midweek game against Fulham in the Checkatrade Trophy. It's a shame that we have no reserve set up to bridge the gap between this side and the first team, but the costs associated are too much for the club to bear. I left for the game around 6.45. I had a reasonable drive over, getting to the ground at 7.20. I went into the ground, which had changed a bit since my last visit. Entry was a very reasonable £3. Wycombe started well and came close with a free kick in the opening few minutes. The Kings Langley keeper made a good save though and nothing came of the resulting corner. The hosts started to get into the game and they took the lead with a shot on the turn after 10 minutes. 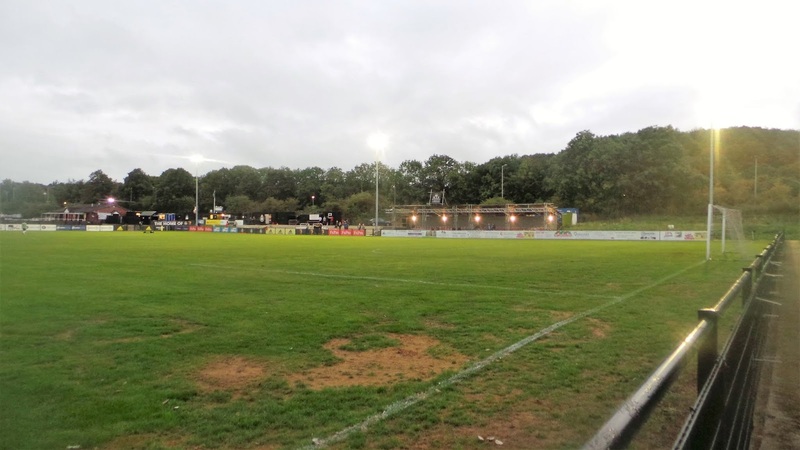 Despite Wycombe trying to get back into the game, it was Kings Langley that doubled the lead on 25 minutes after a player got clear of the defence, played a diagonal ball and left the striker with a fairly simple close-range chance. The third came on 38 minutes, a low curling shot from a fair distance that the Wycombe keeper might have wanted to do a bit better. And it was four on the stroke of half-time, a cross from the right being headed home at the near post. 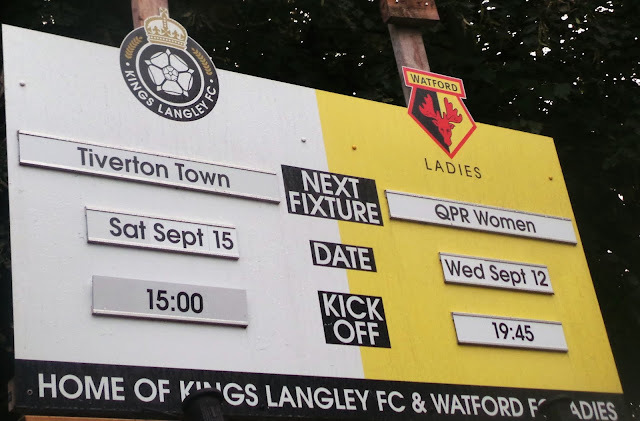 It was a harsh half-time scoreline for the Blues, but the Kings Langley side had a physical advantage being a couple of years older and were also part of an established youth setup. Things didn’t get much better after the break although the 5th goal was very good, a smart lob over the keeper to make it 5-0. 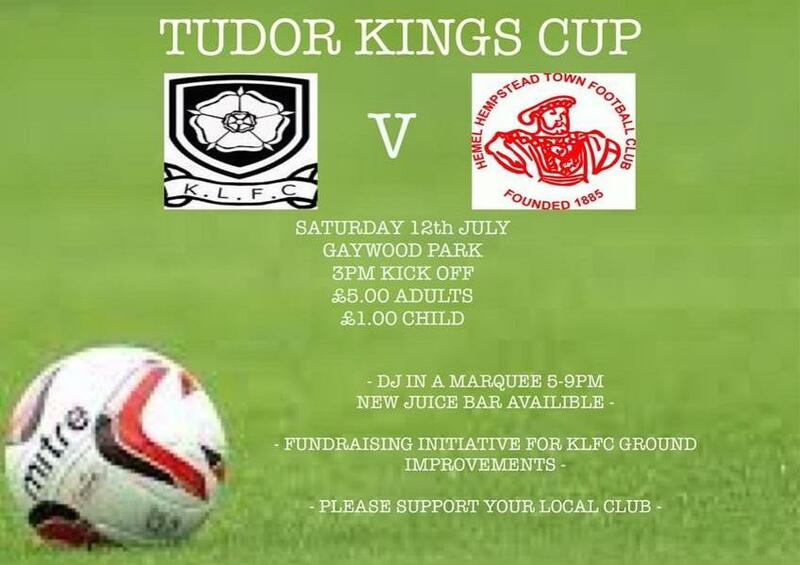 A ball across the six-yard box saw a Kings Langley player given too much space on 57 minutes to make it 6. Wycombe had to rely on chances on the break and shortly after, a surging run down the right and an arrowing shot nearly reduced the arrears but went narrowly wide. Wycombe got some good blocks in to prevent further goals, but a couple of minutes before the end it was 7-0when a good cross field ball was rifled into the roof of the net. That was it as far as goals were concerned, the match ending at 9.40. I had a good journey home and got in before 10.10. Though it had been a heavy defeat for the youth team I’d only heard about at lunchtime, I was glad that we have some kind of a youth setup again, even if they are not connected directly to the club. I’m guessing that results will improve over time as the players get more experienced, but hopefully, in the long term, we will be able to enter a team in the FA Youth Cup. For now, though, it will present me with the opportunity to revisit some local grounds that I’ve not been to for a while. I was unable to find a team sheet on the night, nor the names of the scorers in the days after. On my first visit, GAYWOOD PARK was a pleasant enough venue for Spartan South Midlands League football. There was just the one stand though, holding around 100 seated supporters under cover. The rest of the ground was open. The tea bar was reasonable when I went, offering a bacon cheeseburger for £2.50, which was nice enough. My second visit had seen a lot of improvements. 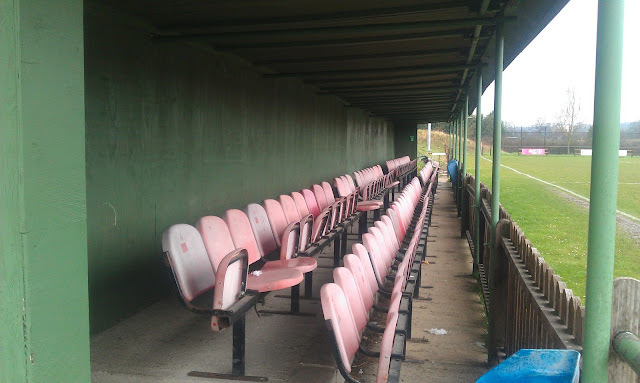 The seated stand was now a lot larger, around 200 in capacity. There was additional cover across the other side, holding another 200. And as well as hard standing, there was extensive terracing, according to official figures the ground now holds 3,000. 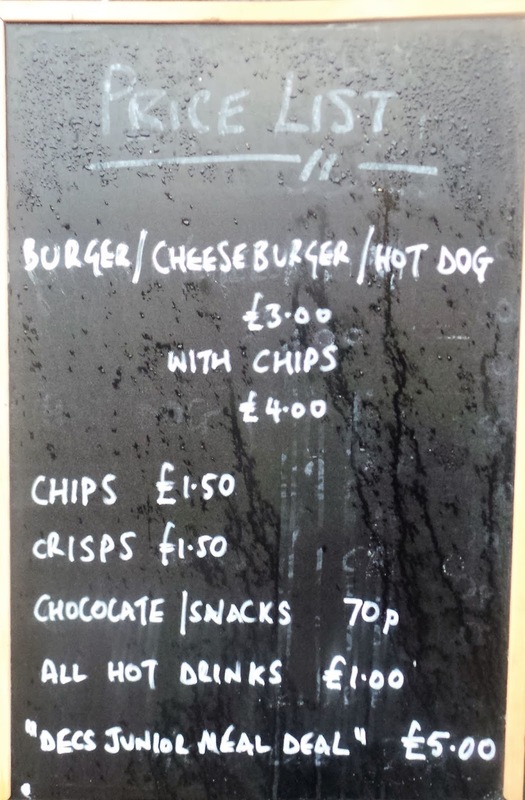 The tea bar was fairly average, the chips that I had were not amazing, but they were only £1.50. The bar looked excellent and has a good range of real ales and real ciders.